Experience more connection with Nature? Explore a wide variety of Natural Building & Sustainability Skills? Be immersed in a Living, Building Community? Consider the 20117 / 2018 INTERNSHIPS & Worktrade ! Attend one or more months at the Strawbale Studio outside Oxford, Michigan, USA. Openings are available April through September and for the January Winternship. The 2017 Program includes a lifestyle of sustainability. Shade-tree classes will be taught on components of natural building ~ foundation, framing, strawbale, cob and use of local materials ~ accompanied by tours of the structures on site. Hands-on activities will focus on earth plastering & sculpting, earthen floors, oil finishes on benches, detailing of living roofs, site hydrology & creative landscaping and permaculture projects. There will be some variation between months based on progress. Daily Lifestyle includes foraging, spoon-carving, fermenting, composting, solar oven, outdoor rocket cooker, earth oven, shiitake mushroom production & more. Buildings on site are the Strawbale Studio, Kids Cottage, Hobbit Sauna, Spiral Chamber and several pretty awesome woodsheds. Living roofs, Thatched roofs. Community connections: Monthly Full Moon Potluck & bonfire, Permaculture Meetup (off-site), 1 or 2 workshops or tours per month for the public. We have local farmers, and get our eggs and some of our produce from them. 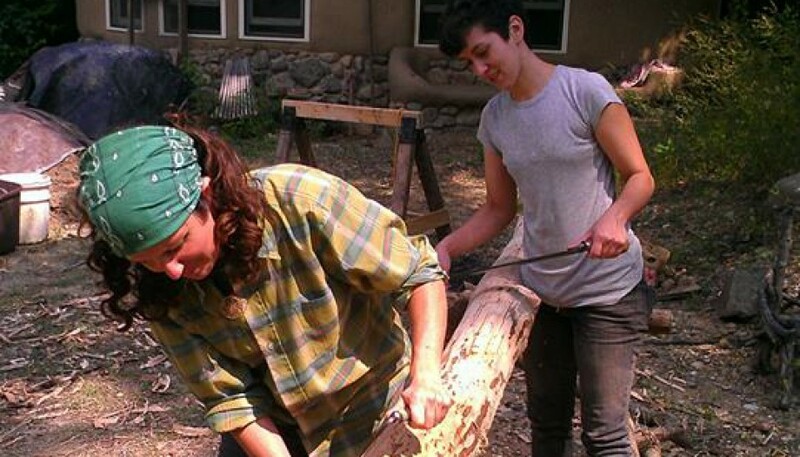 Worktrade activities for 1/2 Pay WorkTraders and Wwoofers at Strawbale Studio are Grounds: firewood, repair, lawn. Office: data, editing, publicity. Garden: planting, mulching, watering & harvesting. Other: repair canoe, solar dehydrator. The Strawbale Studio is a place, and also a program with Internships, Classes & Outreach…seeking to joyfully weave into the Web of Life ! This is a uniquely rich experience. Main Instructor & Coordinator, Deanne Bednar, is the illustrator of the Hand-Sculpted Hous e & the Natural Plaster Book, and has 20 years of experience in natural building. Background: Art & Sustainable Futures teacher at the middle school level. Loves to forage, use materials directly from nature in an artful and practical way ! 3 Program Options: Intern, 1/2 Pay Worktrade, Wwoofer. All 3 Programs include room & board, classes & materials, plus sharing of household activities such as cooking & cleaning. Wwoofer = 20 hours Work-trade per week toward maintenance of gardens, grounds, office. The rest of the time participate in the Internship & all classes. No money exchanged. No wwoofing option during the Winternship or Intensive Classes. 4 Weekend Workshops for Wintern and the Public Thatching Jan 13 & 14. Round Pole Jan 20+21, Rocket Stove 27 & 28, Earth Plaster & Sculpting Feb 3 & 4. CONTACT: Call or text Deanne 248 497 4088 or email ecoartdb@gmail.com to indicate interest or ask questions.